The author of “The Witch Continues tto Enchang as a Feminist Symbol” begins this article by discussing a recent film based on Ruth Bader Ginsburg that begins with the words “this witch” said by conservative Michael Savage. He is infamous for referring to Ginsburg in this way. The use of witch as a describer has grown immensely since the Salem Witch Trials. The author mentions that today, it is oftentimes women themselves who use this word as a way to describe themselves with pride. Even though traditional witchcraft including potions and spells may not be the front of the modern witchcraft movement, it is still a way for women to reclaim their femininity from witchcraft as a feminist symbol. Today, “witch” has evolved into meaning any woman with power. Witches are becoming more prevalent in pop culture including shows like Chilling Adventures of Sabrina and the movie Suspira. The author proceeds to explain how women reclaiming witchcraft is a method of self-preservation and a way of surviving a misogynistic world. There has been a violent history of pain and suffering for all women, and today’s women will not forget that. In the article “Season of the Witch: Why young people are flocking to the ancient craft”, the author claims that Azaelia Banks began the modern reclamation of witchcraft in a tweet from 2014 that said “I’m really a witch”. However, the author also acknowledges that this incident was only one that got significant attention – witchcraft has been reclaimed by women for many generations in the form of tarot readings, astrology, and crystal work. One example of the rising popularity of reclaimed witchcraft is American Horror Story: Coven. This was the most popular season of the show and revolved around the lives of young witches living in the United States. There are other examples of how witchcraft has intertwined itself with the feminist movement. For example, feminist publications have recently began to include tarot reading instructions, books about witchcraft, and herbal medicine guides. The power of a witch is something that has been essential part of women’s activism since the Salem Witch Trials. The article further explains how witchcraft and Wicca are direct ways for women to be in tune with their souls and their divine femininity and spirituality. There is an inherent political intention behind women’s reclamation of witchcraft – it is a way to become liberated from the patriarchal holds of the world. The author also notes that witchcraft is not inherently linked to women always, but it definitely tends more to the needs of female representation. Reclamation of witchcraft stems from the respect, admiration, and inspiration that modern women have for the women who have suffered before them. It’s a way of remembering where we were, where we are now, and what the future may be like. In an article published by “The Conversation”, the author of “The evolution of the midieval witch – and why she’s usually a woman” describes the usual stereotype of witches based on their Halloween caricatures. One of the biggest common characteristics of witches is the ability to fly. However, as historical interpretation of witchcraft has evolved, the meaning of “flying” has changed significantly. Instead, the focus turned to fear of witches, which led to intense hate and violence directed towards them. As a result, people began associating many other negative and evil actions to witches such as orgies, meetings with the devil, and sacrificing babies. The author also points out that witches have historially been hunted for deeply misogynistic reasons. In addition, practice of witchcraft was seen as a form of rebellion against traditional faiths and churches, so many began to use religion as a reason for the persecution of these women. Historically, women were more commonly associated with witchcraft due to ideas that women are intellectually inferior and as a result, were more susceptible to demonic influence. Reclaiming the Power of the Witch by Mariah is licensed under a Creative Commons Attribution-ShareAlike 4.0 International License. This was an interesting and cool summary to read. I didn’t know that there are women today that referring to themselves as witches. 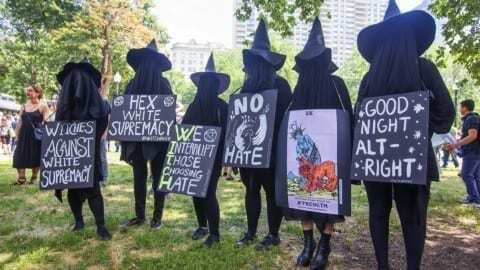 But, it is interesting that they are claiming themselves as witches for a completely different reason rather than what they would typically stand for. I am interested and intrigued to see what else other information you come up with.